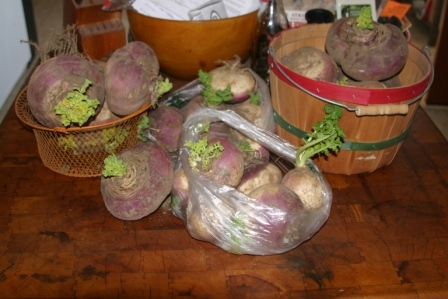 A retired co-worker visited the other day and brought 2 huge feed sacks of his home grown turnips. I happen to love them and put them into almost any soup or stew or pot roast. I have made turnip and potato mash but wanted to do something a little different. This is a casserole that pairs with just about anything. Use fresh greens though because canned ones just won’t have the correct texture and flavor. In a large skillet heat EVOO over medium high heat. Sauté onions, thyme and sage. Cook about 5 minutes until onion is tender. Add green and cook for another 2 minutes. Remove from heat and set aside. Combine 1 cup turnip slices, 1 cup potato slices, water, milk and garlic in sauce pot. Bring to boil and reduce to a simmer over medium low heat for 10 minutes. Remove from heat and put the milk mixture along with the flour, salt and pepper into a blender. Blend until smooth. Be cautious mixture will be hot. Set aside. Cook a 2 quart baking dish with the no stick spray. Arrange half the remaining potatoes and turnips in the bottom of the baking dish. Top with onion and greens mixture. Cover the greens with ½ of the cheese. Top that with the remaining potatoes and turnips. Pour blended milk mixture over that. Cover tightly with foil. Bake covered for 45 minutes. Uncover and bake for 20 minutes. Sprinkle the gratin with remaining cheese and put on top rack of oven. Bake for 5 minutes or until cheese is melted and browned. This entry was posted in sides and tagged casserole, cheese, turnip greens, turnips. Bookmark the permalink.